My problem with a "dark" corner of the office is that what little light gets in is promoting growth. I hope this isn't a bad thing, and if it potentially is, should I find even darker? Maybe a room in total darkness with a grow lite timed for oh, say, an hour or two per day? Not a problem at all. You don't really want them to be in complete darkness or try and slow their growth more than you have to for say, space reasons. I never like "going to sticks". What you have there is just fine. Is there a reason you don't want them growing at all? 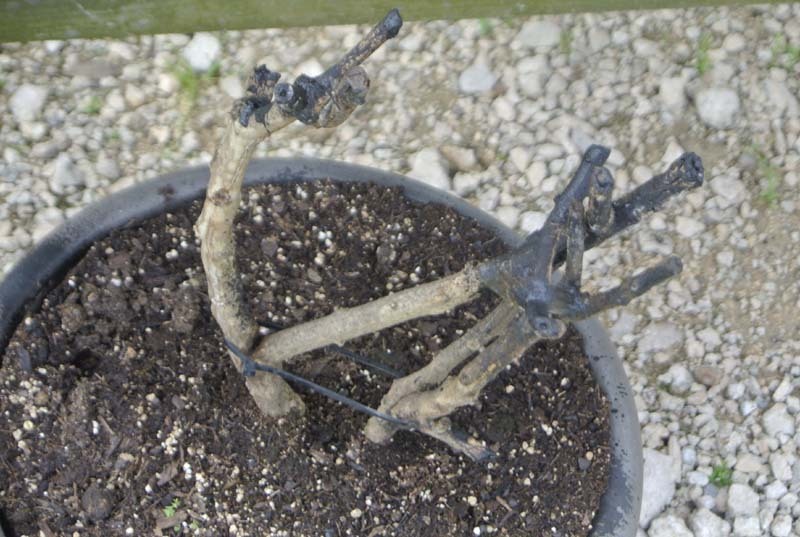 Thanks for setting me straight, you may well have saved these guys from a life as a bonsai! 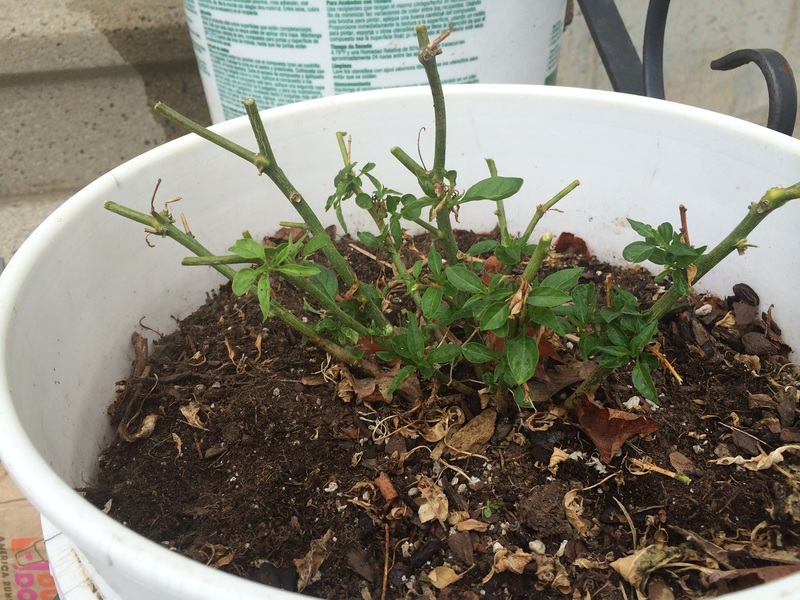 My experience on three years of overwintering. 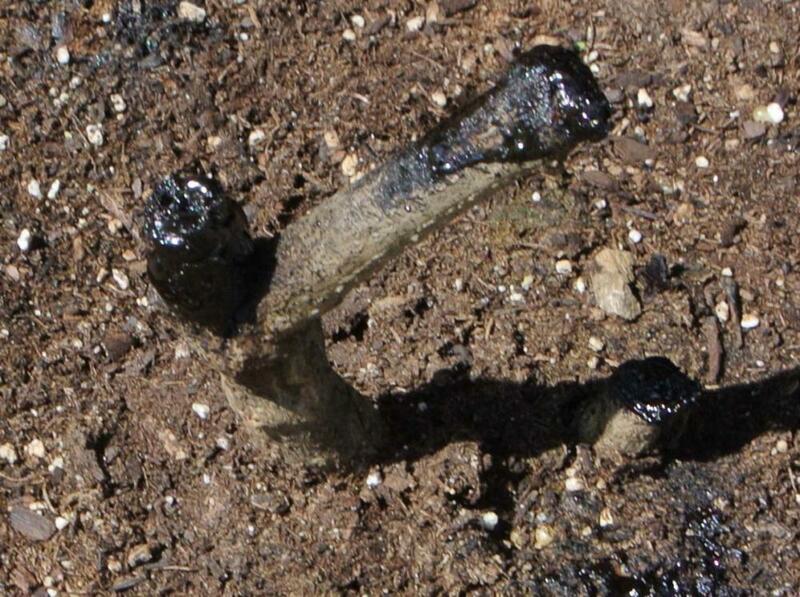 - Full dormancy is much more difficult to recover from and takes about 4 weeks longer to flower and fruit. - Semi dormant plants growing slowly with just a few leaves are faster to bounce back and are easier to keep disease free. - If I cut them back before first frost and allow them to grow out before coming inside they do even better and bounce back even faster. Another issue I forgot to bring up is how dry the air is here when the outside temp is -20° and we use a forced air propane furnace. A fully wet pot takes two days to be bone dry. Getting a watering schedule down is impossible. You could try 5 gallon bucket of water nearby to bring up the relative humidity? Yes, and we have a humidifier that wasn't very well maintained, but something is better than nothing. 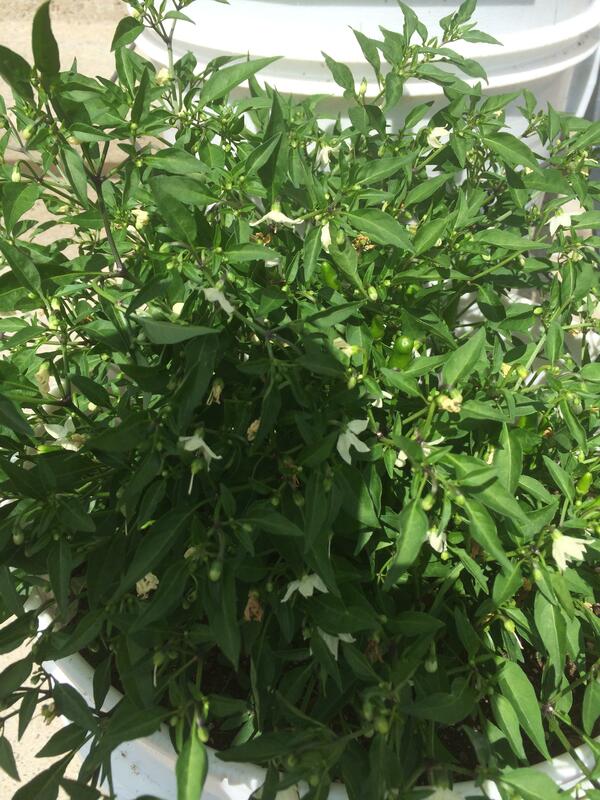 These plants really made happy peppers last year, they can only get better, right? The Amarillo concerns me because the leaves are much larger, and the cupping is practically folding the leaves in half. The lighting is deceiving, the plant is in quite a bit more shade, though there is a natural source at either end of the room. my amarillos did the same thing indoors last year. they did just fine once they got outside. may be a humidity or light intensity thing? i don't know myself. Could just be the change in transpiration due to any pruning that occurred. Or simply just being indoors. Generally leaf symptoms are nutrient or transpiration related. Granted we are in North Florida, what we experience as "winter" pales in comparison to many out there. Nevertheless, this was my first experience in "overwintering" with respect to the awesome information provided on this site. I have been gardening for nearly 40 years, and with peppers, sometimes it was fantastic, and sometimes, downright ugly. 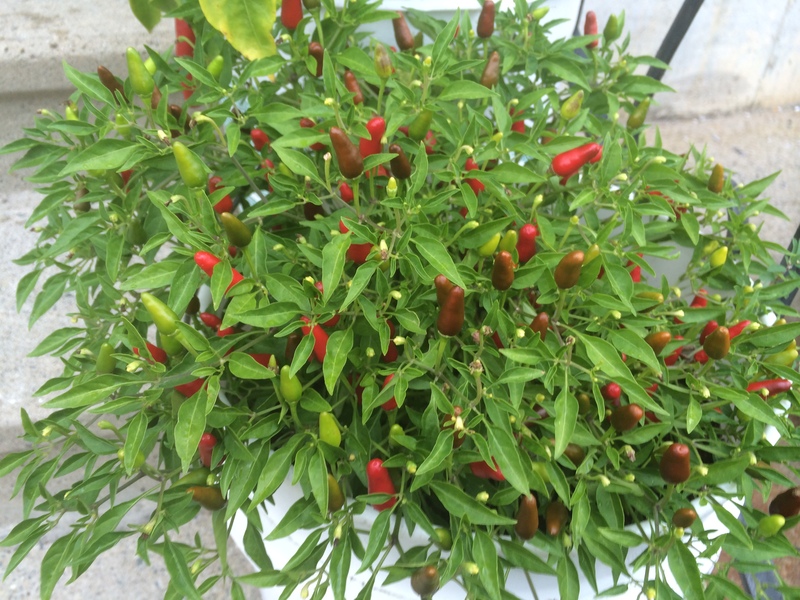 Over the past two years, we just kept hitting a wall with pepper plants. 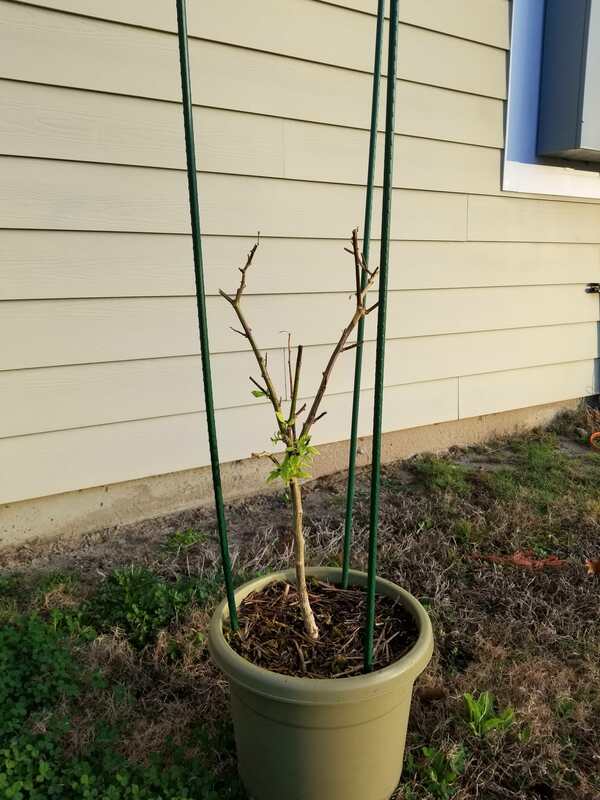 They would come home fine from the store, look great for a week or so, then either get pest infestations, nematodes in the soil, or drown from all the rain (and yes, over-watering), and become "sticks in a pot". In 2017, after reading through many of the tutorials and glogs on this site, it dawned on me that I was approaching this all wrong. 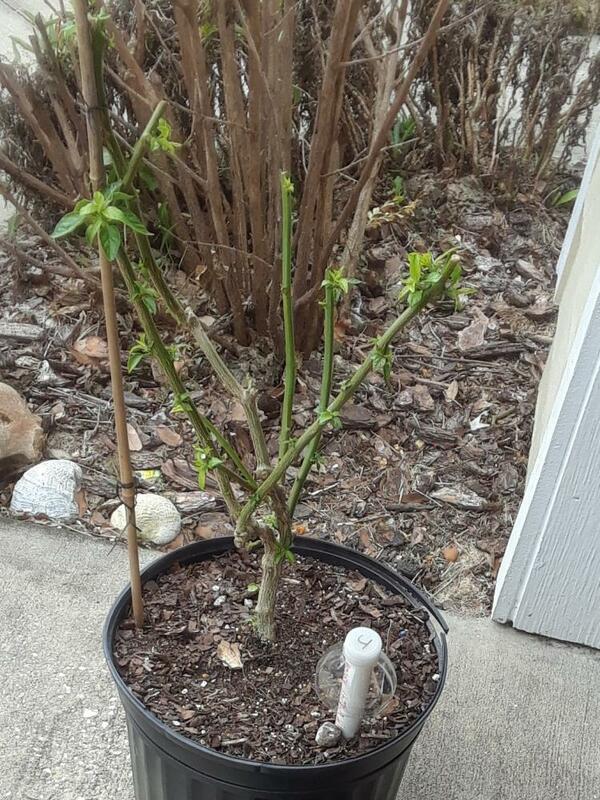 I bought 2 plants from the local HD, brought them home, and embarked on the quest in a different manner. Over-watering has seemed to be the biggest challenge here, and especially if you get torrential rains when you don't need them. I am container-growing these, for reference. When I started, I bought a Red Bhut Jolokia and a Habanero the same day. I placed them both in individual, dual-bucket systems, to control the watering, and protect them from native soil issues (nematodes). 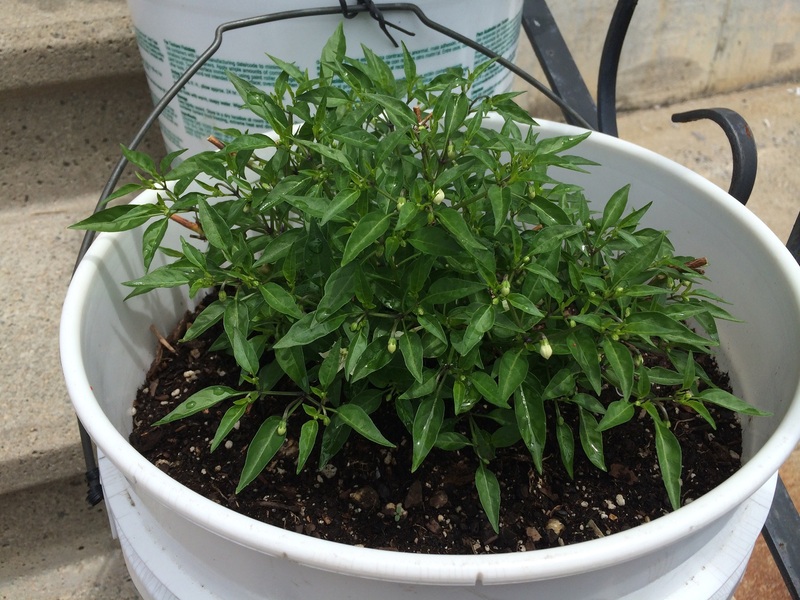 The Habanero continued to have issues, leaf drop, etc., while the Red Bhut thrived. I bailed on the dual bucket approach with the Habanero mid summer, and went to a single pot approach with a gravel bottom. Realized I have to bottom water this one really sparingly. Leave it out in the rain, and it poops out again. 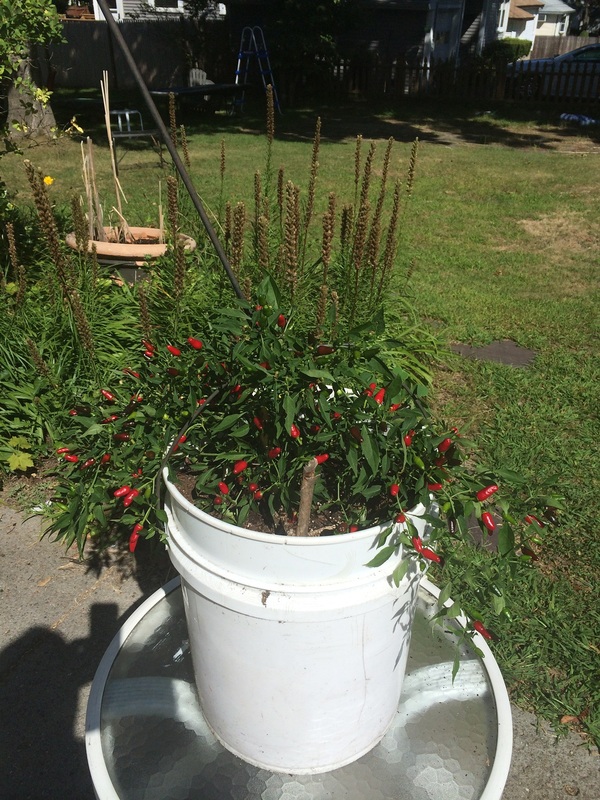 Kept the Red Bhut in a pot with a bottom-watering basin to control things, and it went great all year. Now, these are both camped out in the garage while pouring rain and or freezing. 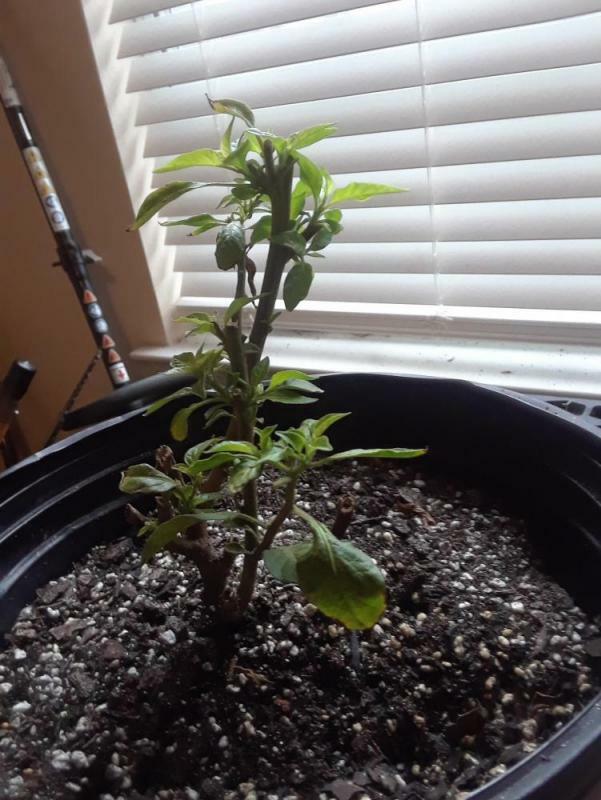 The Red Bhut is cut back and new growth is appearing and growing well just within the 3 days between pics. 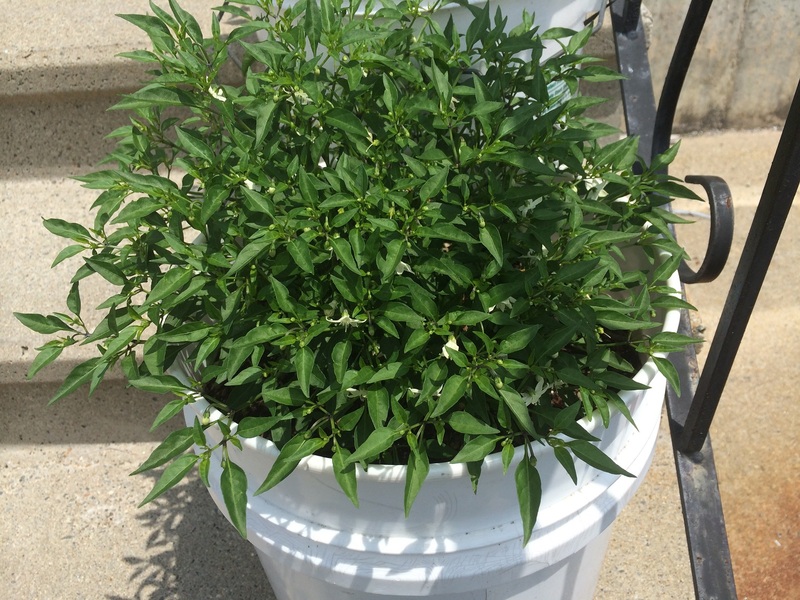 The Habanero is also showing new growth, but has been very sensitive to watering. I did not chop off any root material from the Red Bhut, fearing I will screw up a good thing. It's not root bound, but I am wondering if I should just let it go through this next season as is? Going to let the Habanero catch up on it's own. Life will find a way... Pulled my only pepper I grew last year (some sort of hab level heat mystery cross) into the garage in November to harvest the last peppers, fully intending to bin it and start everything fresh this year. Low and behold, about a week ago I was cleaning out the garage, and was about to pull it out of the dirt and toss it, when I noticed something. Now, my garage has no windows whatsoever. Pitch black. It's a 1 car, and is mostly used for storage, so it has been that way for most of the winter. Granted, the temp doesn't get too low, but easily into the low 50s, maybe high 40s. 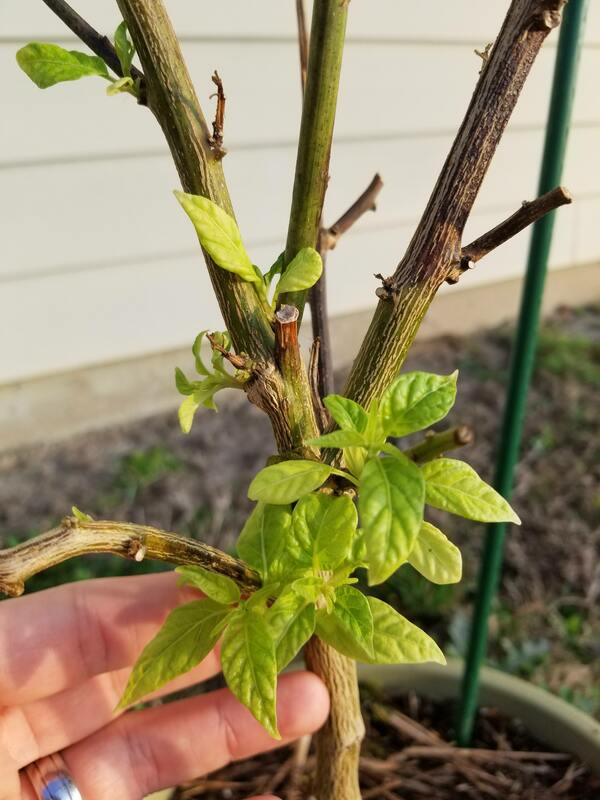 I thought thus plant was toast for sure, but I noticed little white leaves popping out. I wish I would have taken pictures, because it was so cool looking. I started to harden it off a little, and now have it back outside soaking up some South Carolina winter heat. The leaves have definitely greened up a bit lately, and I think I just accidentally overwintered my first pepper! 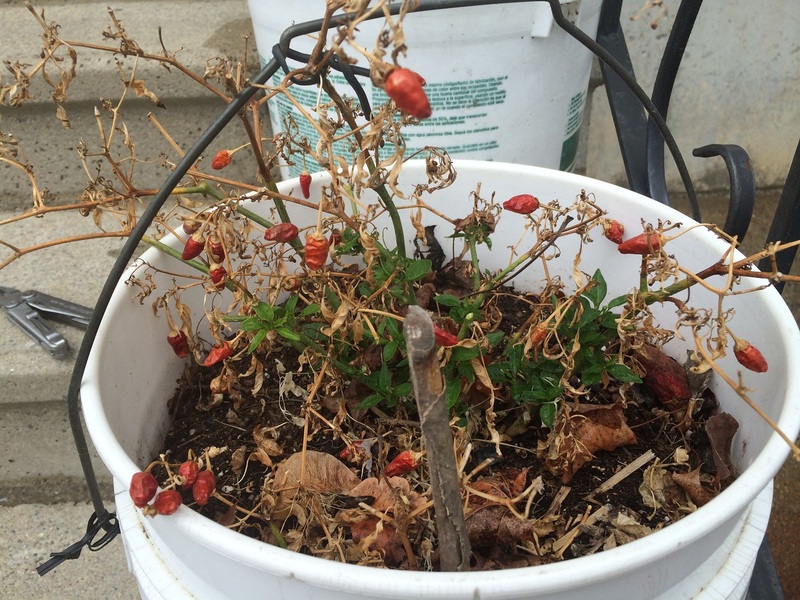 Hey, folks - I have a question about dormancy and the return to life. 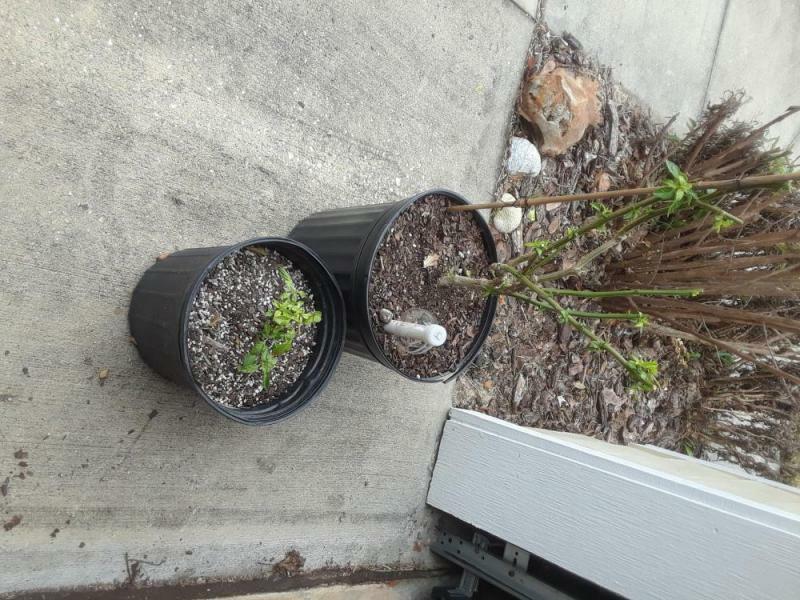 . . We had a very mild winter, however, I pruned the 4 bushes back. There's 2 reapers and 2 Tabasco. I sealed the branches with pruning sealer. 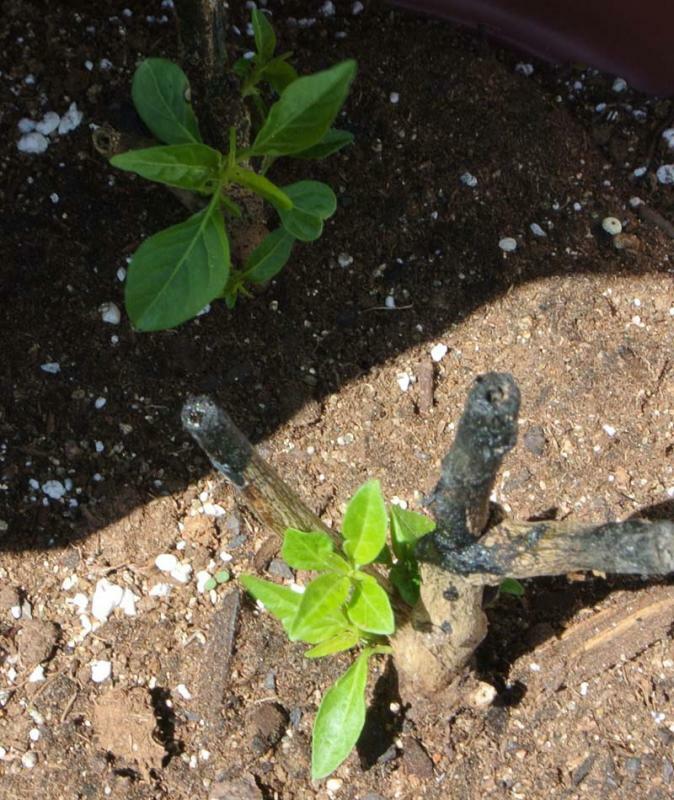 It's spring-like now and I took the plants back outside and the Tabasco plants are already bringing forth new leaves - the reapers are doing nothing. I broke one of the stems - moist and matches a broken stem of the Tabasco. I looked at the root structure and it looks good. The reapers were very productive plants - I want to say that the reapers are on their 3rd season. I enjoy both of the fruits and the Tabasco's are really good and won't make you cry as the reapers do. Any thoughts? Super hots take a bit longer sometimes, keep it in increased light conditions and it will re vegetate. Post back with results! Will do - what's weird is they were both trying to produce shoots back in Dec when it was unseasonably warm. I simply pinched them off and tried to ensure a real dormancy and we had enough cold to do so. I will get some pictures posted. I sure hate to loose the Reapers - I spread those peppers far and wide, from Maine to Oregon. Well, folks - today I had to make a decision - my most productive reaper plant didn't make it through the many extra inches of rain. Yet the Tabasco did. I always put two plants together in one pot as fail safe. I'm hoping that these survive. Reminds me of an old Bible verse. Not he who plants or he who waters is anything - but God who causes growth. Post cut - not much left - but, the smell was gone and I couldn't peel the bark off. Tabasco that wintered right along side the reaper. Those were definitely pruned a bit more than I would suggest. Going to be hard to make a full comeback, but I've seen it before. 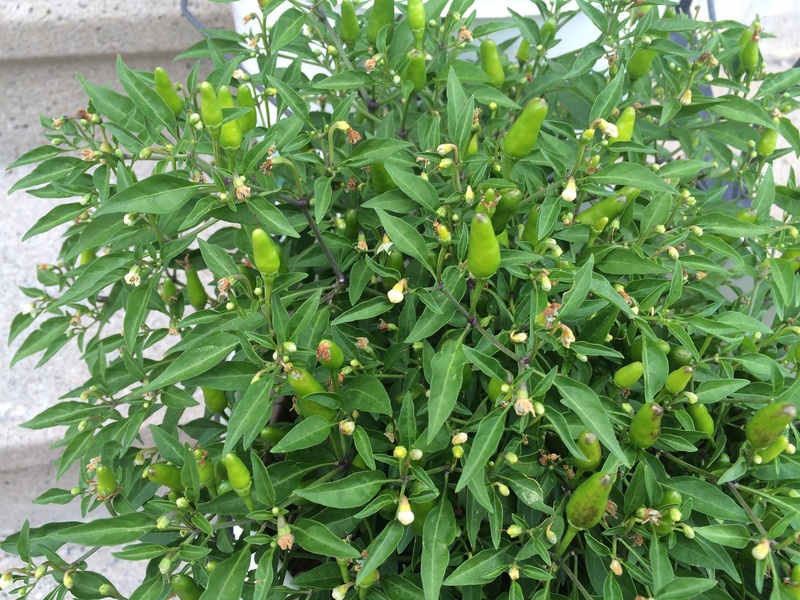 It's only April, but my Aji Mango has been flowering for well over a week and I have pods forming! What an aggressive, ambitious little plant! The Aji Amarillo is also flowering, but only just. They both have an insane case of cabin fever, but we are still getting snow and below freezing temps this Spring. The growing conditions for both was - plants were brought indoors at my work location. The entrance door to the warehouse was south facing and had light from dawn to dusk but had direct sun for 3-4 hours in the afternoon. The plants were left in their 5 gal. home and full size - read that as no root or plant trimming. 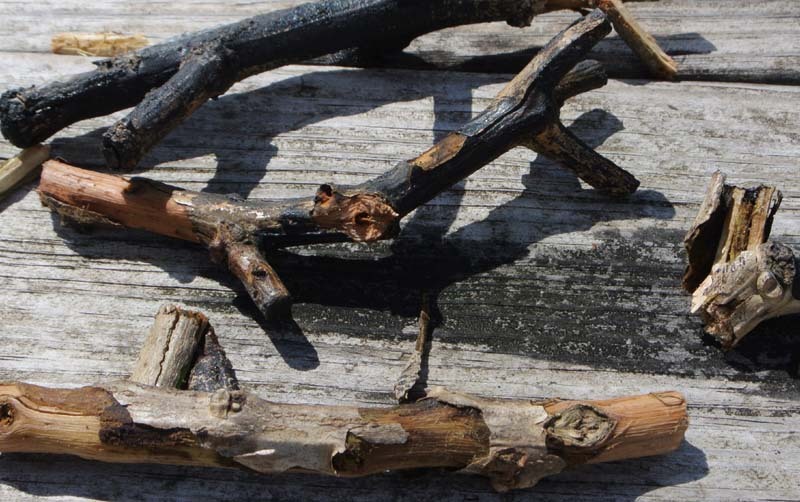 With limited sunshine the plants outer branches died - turned brown - and I cut this deadwood off as required during the winter. Water was added on "as needed" schedule - dug a few inches down and if dry, water was added. Nothing else like nutes & no aphid/whitefly issues. Pix are progression from end of season 2014 to end of season 2015 - nutes were used during 2015.